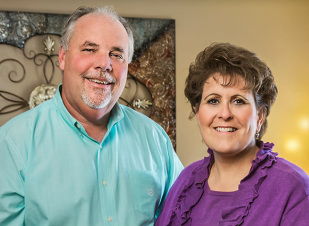 We’re Jerry and Shelley Gramke — owners and operators of January Service Company, which has been providing quality food and beverages since 1982. We became partners in the business in 1997. And in 2012, we became sole owners. We’ve been in vending since 1979. From running routes, to sales, to maintenance, to management — we’ve done it all. Jerry’s even been president of the Tennessee Automatic Merchandising Association (TAMA) and chairman of the Southeastern Vending Association (SEVA). But we couldn’t have done any of it without our crew. worked here for over 20 years. We think of our team as family. And we treat our customers like family, too. That’s why when they call, it’s one of us that answers. We like knowing what’s going on with them. They like it, too. But our traditional values don’t mean we’re behind the times. We’re all about progressive technology. We always have our ear to the ground to see what new services — like our micromarkets or self-filling water coolers — are out there. So we can save you a little money or make your day run a little smoother. So give us a shout. Whether it’s to ask about services, set up a tour of our kitchen, or just to say hi.